Write a C++ program to addition two matrices of same dimensions. In this program, we will add two matrices of size M X N and store the sum matrix in another 2D array. 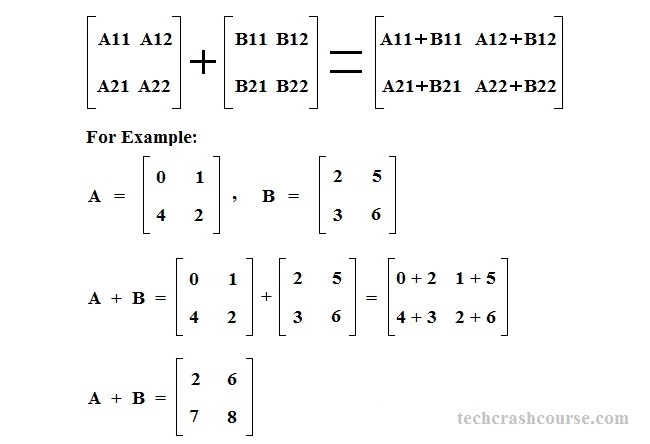 Let A and B are two matrices of dimension M X N and S is the sum matrix(S = A + B) of dimension M X N.
To add two matrices we have to add their corresponding elements. For example, S[i][j] = A[i][j] + B[i][j]. Traverse both matrices row wise(first all elements of a row, then jump to next row) using two for loops. For every element A[i][j], add it with corresponding element B[i][j] and store the result in Sum matrix at S[i][j]. In above program, we first user to enter the dimensions of input matrices and store it in variable rows and cols. The dimentions of matrices must be less than 50X50. Then one by one, using two for loops we take input for both input matrices and store. Finally, using two for loops we add the corresponding elements of two input matrices and store it in corresponding element of sum matrix. Let A, B, and C be M X N matrices, and let 0 denote the M X N zero matrix. Two matrices can be added only if their dimensions are same. If the size of matrices are not same, then the sum of these two matrices is said to be undefined. The sum of two M × N matrices A and B, denoted by A + B, is again a M × N matrix computed by adding corresponding elements.